Rice, (Arisi in Tamil) also known as Paddy, a raw crop (Nel in Tamil) is a pre-dominant food for half of the population in the world. It constitutes the staple diet of many of the Asian and African countries. The origin of this wonderful crop and its cultivation history has been a constant theme of search and re-search for not only historians, Plant Scientists but also for sociologists, anthropologists, and other students of cultural studies. The origin of the word ‘rice’, has though been known to philologists and etymologists, it had received little scholarly attention from the botanists , plant paleontologists and Archeologists. It is not a surprising the Tamil etymologists on the spread of the word Arisi to Rice. Arisi (root word ari-arisu-arici-ori-orizu-rice. According to Tamil etymologists, the Tamil linguistic law - loss of vowel in Tamil makes arisi toorizu. The trade route taken by ships from Rome to Tamilakam had been described in detail by writers such as Strabo and Pliny, the Elder. The Greek and Arabic names for rice (Oryza and urz), ginger (Gingibar and zanjabil) and Cinnamon (Karpion and quarfa) are almost identical with their Tamil names,arisi, inchiver and karuva. The imports were mostly luxury items such as glass, gold and wine. There are around 250+ traditional varieties of rice in South India alone, in which most are extinct due to modern day farming. Now dafter a vast effort by ecologist Dr.NAMMAZHVAR Ayya, about 153 lost varieties of rice are being revived.We work on letting people know about our traditional rice varieties, their magical benefits and make them available for the public. 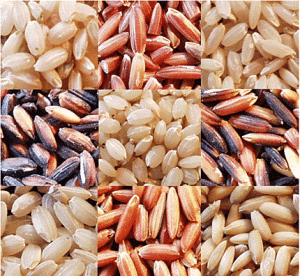 THE TRADITIONAL RICE VARIETIES DO NOT NEED ANY PESTICIDE OR ARTIFICIAL FERTILIZER FOR THEIR GROWTH AND YIELD. In the fore coming blogs let us see the valuable health benefits of each of this rice in detail.